The Herdsman, a typical spring constellation, located far from the Milky Way, is a very memorable one. Some observers see the Herdsman as a paper dragon, others see the constellation an ice cream cone. Boötes in Latin means ox driver. The seven stars of the Big Dipper (directly "Top right" of Bootes) are considered in this translation as an ox. Thanks to its close proximity to the Great Bear, this constellation is very quick and easy to find in the sky. The Herdsman is circumpolar and therefore it can be seen all year round over the northern sky. 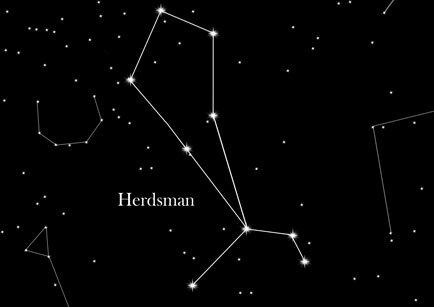 Since the Herdsman is very rich in double stars, it can be spotted even with binoculars on a good night. Nearest constellations are Hercules and Virgo. Legend has it that Callisto, one of the young women in the wake of the hunting goddess Artemis, was pregnant and then abandoned by Artemis. The wife of Zeus, Hera, turned Callisto into a bear and her son Arcas became an avid hunter. One day, while hunting, he met the bear and wanted to kill his own mother because, of course, he did not recognize her. Fortunately, Zeus intervened and prevented a disaster. Both were sent to the sky, the mother as the Great Bear, and the son as the Herdsman.